How are you today? Are you having a good week or has it been kinda ‘meh’? I like to measure in half days! Allows more flexibility and less pressure. When I do need lifting up, friends can really make a difference! 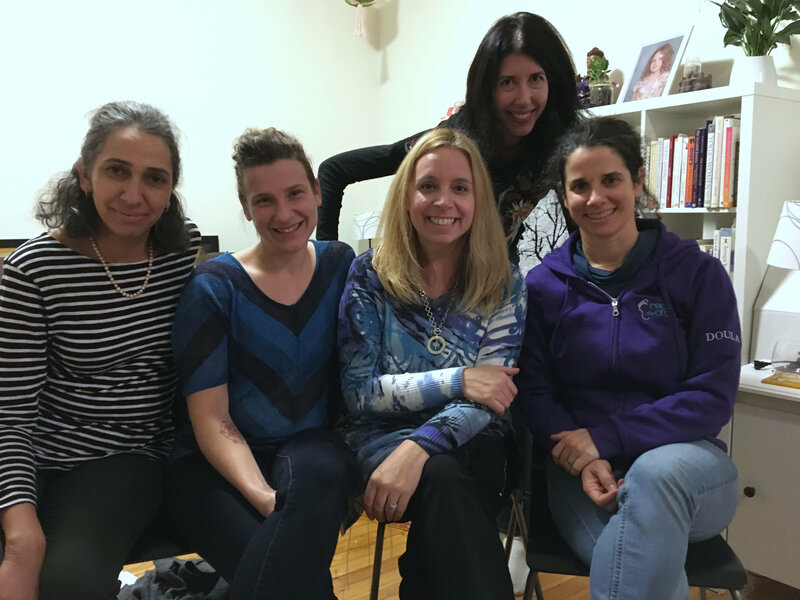 Here is our team of Rock the Cradle Doulas (minus Yvonne Pelling) as we gathered to celebrate Jenny Bee‘s new apartment last night. We were supposed to discuss some aspects of work, but I must say that we chatted about almost everything else except work. LOL. It’s such a privilege to have work mates that are also amazing friends! I don’t think many people can say the same. Tristan (10 yo): Even if it was Ricardo himself who made this veal liver, I’d still find it disgusting! 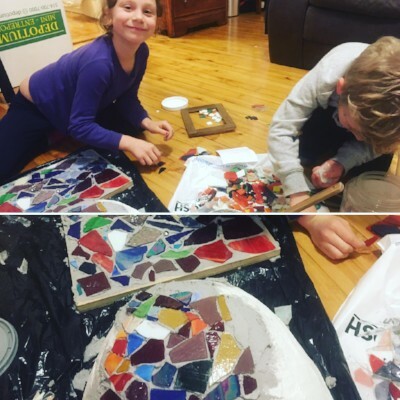 Jenny: This week I found myself with extra time to work on a very special project – a mosaic belly cast for one of my yoga students! I casted her belly the day before she went into labour. Eight weeks later, her beautiful fruit bowl is nearly done. Arts and crafts are huge chez nous and this project has taken many hours. I’ve had my 7yo by my side for most of this project. I can’t wait to give the final project to its owner! If you’d like to have your belly cast, let me know as it’s a new service that we offer! 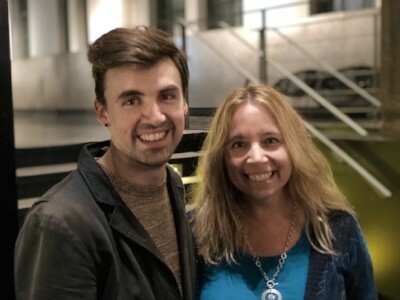 Sylvia: Last week I had the pleasure of seeing one of my husband’s friend’s new documentary ‘Un Homme Sage-Femme’. It’s the story about Louis Maltais, Quebec’s FIRST male mid-wife! And what a surprise to see one of my own doulas in his class!! It’s a beautiful and touching film. We follow Louis throughout his 4 year program and learn about the various challenges he faces as a student, but also as a man in a traditionally female role. What I really took away from this movie is that it’s all about the person – not the gender! Would you mind having a male midwife or Dr? This is us after the movie! Just like a good doula, this beautiful book (I love the illustrations) that just came out early this year is a wise companion for pregnancy, birth, and the postpartum period. Even includes recipes for a few nourishing tonics and soups, and a list of some excellent resources. Heather: Essential oils: lavender, peppermint, and lemon. I like to put a drop on a cotton pad. If mom likes it, then she can hold the cotton or place it near her. If not, then in the toilet it goes, no trace of the scent in the air. Mika: My favourite calming method uses a birth/physio ball. If you’ve tried everything on your list to soothe your baby to no avail, you can hold your baby in your arms or in a carrier and gently bounce up and down. The vertical bouncy movement has a calming effect for babies as it mimics the movements when they were inside your belly! We’re booking clients into next Spring but still have room for Holiday and New Year babies! If you or anyone you know are thinking of having a doula, join us at our next Open House, this Wednesday, November 21 from 7:30 p.m. – 8:30 p.m. at Equilibrium Yoga (4812 St-Laurent Blvd) and meet us in person to ask all of your questions. Well, that’s been a really big week! Oh yeah – We need your help! Since we don’t have tiny ones at home anymore, we’d love to know your favourite mom and baby gadgets! Thanks! P.S. If you didn’t catch us live last Friday, check out our latest episode of our Facebook Live Show, Doula Dialogues, Episode 6: What is a Doula and How We Can Help you Birth .